Ergonomic knurling patterns. Titanium bodies. Caps securely snap open or closed. Fisher ink cartridges. Black ink. Made in U.S.A. 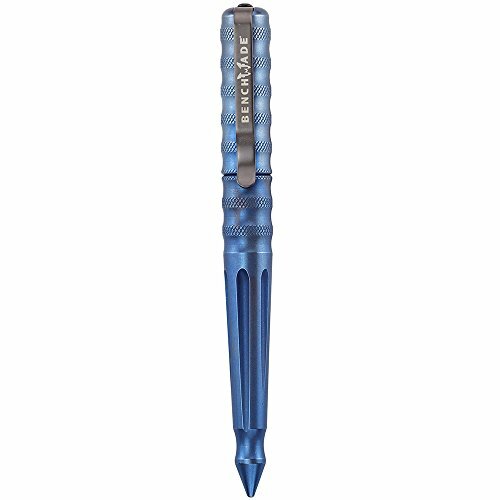 HIGH-QUALITY: All pens are made of anodized aluminum, titanium, stainless steel, or damascus bodies to provide a sturdy shell. WELL-DESIGNED: The O-ring pressure fit cap securely snaps open and closed to keep the ink from drying out. COMFORTABLE: The ergonomic knurling pattern provides optimum comfort and minimum stress on the hand. LONG-LASTING: The Fisher Space Pen ink cartridge allows continued use beyond an ordinary ballpoint. GUARANTEED FOR LIFE: Benchmade's limited Lifetime Warranty ensures that your pen will be free from defects in materials and workmanship. If it's not, Benchmade will take care of it. Available for pens purchased from an authorized dealer. If you have any questions about this product by Benchmade, contact us by completing and submitting the form below. If you are looking for a specif part number, please include it with your message.